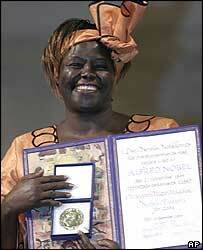 Kenyan environmentalist Wangari Maathai has been presented with the Nobel Peace Prize for 2004 at a ceremony in Oslo. Professor Maathai, also Kenya's deputy environment minister, is the first African woman and environmentalist to win the prestigious award. The 64-year-old was honoured for her campaign to save Africa's trees and for promoting social, economic and cultural reforms that are ecologically viable. She was described as an example for all Africans seeking democracy and peace. "There can be no peace without equitable development and there can be no development without sustainable management of the environment in a democratic and peaceful space. "This shift is an idea whose time has come," said Prof Maathai in her acceptance speech. "Industry and global institutions must appreciate that ensuring economic justice, equity and ecological integrity are of greater value than profits at any cost." Introducing her at the prize-giving ceremony, Nobel committee chairman Ole Mjoes said that conflicts such as in the Middle East and Sudan's Darfur region had their roots in competition for natural resources. 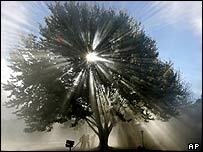 "Environmental protection has become yet another path to peace... There are connections between peace on the one hand and an environment on the other in which scarce resources such as oil, water, minerals and timber are quarrelled over," he said. Prof Maathai is the founder of the Green Belt Movement, which has planted 20-30 million trees in Africa to counter forest loss and slow the spread of the deserts. The movement went on to campaign on education, nutrition and other issues important to women. She was elected as an MP in Kenya in 2002, and became deputy environment minister in 2003. Prof Maathai beat a record 194 nominations, including former chief United Nations weapons inspector Hans Blix and the head of the UN energy watchdog, Mohamed ElBaradei, to win the prize. She picked up a cheque for 10 million Swedish Kronor ($1.4m), a gold medal and a diploma at the prize-giving ceremony in Oslo's city hall. The event is being held on the anniversary of the death of Swedish philanthropist Alfred Nobel, who launched the peace prize in 1901. The Nobel: Dynamite or damp squib?